Sublimation involves a substance that changes from a gas to a solid without ever becoming a liquid. In the hard surface sublimation industry, an image is printed onto transfer paper using dye-based inks and then transferred onto a specially-coated surface with heat and pressure. We manufacture blank products, and you sublimate. For small format, all you need is an A4 printer and heat press. 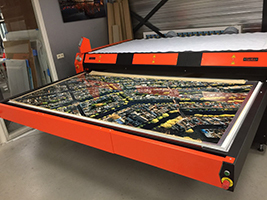 For larger format, printers go up to 1.5m wide and heat presses up to 1.3m x 2.5m. 1 - choose any picture, illustration or graphic image - color or Black & White. 2 - Print the image using sublimation inks and paper. Tape the paper to our coated product. 3 - Position the product on the heat press and apply pressure for the appropriate time. Remove the transfer paper from the surface and Enjoy the Wow! 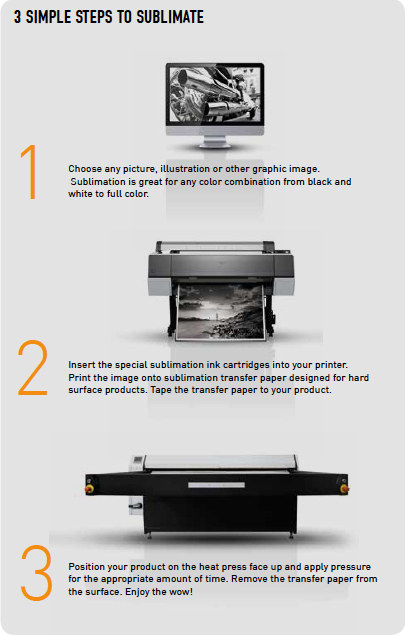 You need a printer to create the prints on the sublimation paper. There are a range of different printers, depending on format, including Epson, Sawgrass and Ricoh. The process uses a special sublimation paper that releases the ink gas easily. Each printer has recommended papers designed to suit its inks. You need top quality ChromaLuxe hard print substrate to produce the highest quality prints. Click on Learn More to find out exactly what you need and to download our guide.